Camping Dun-le-Palestel er en campingplads i Dun-le-Palestel, Creuse. Denne campingplads har pladser der er afmærkede, med skygge, uden skygge og pladser med en smule skygge.Det er muligt at leje telte og mobil homes. Lodgetelt - Tente safari \"Papillon\"
Our 2 brand new (2018) safari tents "Papillon" are equipped for up to six people. With a floor area of almost 40 square meters and headroom throughout the tent, you have no lack of space. The front of the tent can be opened completely, with nice weather this is very nice. There are two sleeping cabs in the back of the tent. There are two bunk beds in one sleeping cabin and a double bed (140 x 200 cm) in the other sleeping cabin. In our safari tents there is a kitchen on wheels that is easy to move outside, so that it can be cooked outdoors when the weather is nice. The kitchen is equipped with a four-burner, thermally protected gas appliance. In the kitchen cupboards you will find crockery and everything you need to cook a delicious meal. An important feature of our safari tents is the awning so that you can sit outside even in less weather. Under the awning you'll find a lounge set with a low seat and in the living area a high table with chairs that can all be easily moved. Of course there is electricity and there is lighting in the sleeping cabins, the living area and under the awning. There is also a fridge, coffee maker, kettle and a small stove. You can use the sanitary facilities nearby. Bungalowtelt - Tente tunnel \" Chevreuil\"
Large family rental tent For 4 persons In our brand new and very spacious family tents you are sure to have a successful holiday! You can stay in this tent with up to 4people and still have enough living space. The ceiling has 2 large skylights, flooding the interior with sunshine and at night you can watch stars. The three separated sleeper cabins can be joined to create 1 large sleeping area if you wanted to keep an eye on your children. The spacious living area has a kitchenette with fridge, gas cooker and of course a complete kitchen inventory. Outside, you can sit on the garden set or laze in the luxurious sun loungers. Board games,playing cards and table tennis bats are placed in every tent. Denne inspektør besøger hvert år Camping Dun-le-Palestel og inspicerer campingpladsen ud fra omtrent 200 faciliteter og andre fokusområder. Inspektøren arbejder for ACSI og arbejder altså ikke for campingpladsen. Vil du booke Camping Dun-le-Palestel eller have yderligere information? Det kan du via nedenstående oplysninger. Fra Dun-le-Palestel mod Crozant. Lige ud gennem rundkørslen. Til højre efter 1 km. 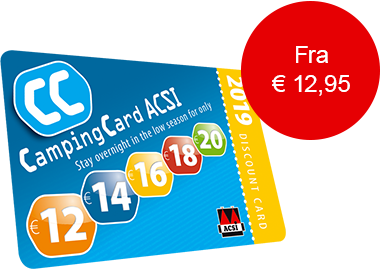 ACSI Eurocampings sender din forespørgsel videre til "Camping Dun-le-Palestel".